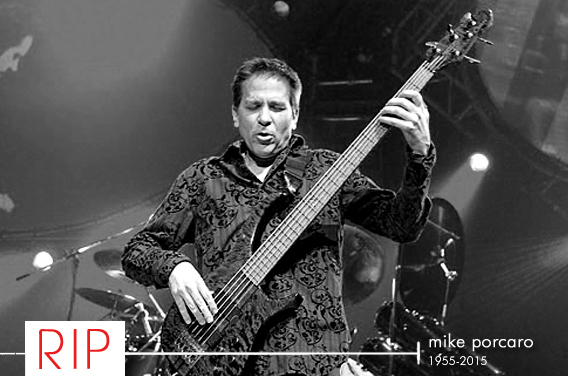 Longtime Toto bassist Mike Porcaro, 59, died on early Sunday morning following a very tough battle with amyotrophic lateral sclerosis, also known as Lou Gehrig’s Disease. Mike Porcaro came into Toto as the group’s bassist after David Hungate left the group. Upon his arrival in 1984, the Grammy-winning group had already reached the apex of their career. 1982’s Toto IV, a multi-Grammy award winner which yielded chart-topping hits like “Africa” and “Rosanna,” had already put the band at the top of the soft rock food chain. But as the middle brother of Toto members Jeff Porcaro and Steve Porcaro, he became a perfect fit into the group. His first appearance on 1984’s Isolation also featured the debut of Fergie Fredericksen in the lead vocalist spot after original lead vocalist Bobby Kimball exited. That album featured the Top Ten hit “Stranger in Town.” He would appear on every Toto album following until his exit in 2007, including Fahrenheit (1986), Mindfields (1998) and Through the Looking Glass (2002). In 2007, Porcaro departed from the group as his illness, sparked by numbness in his fingers, weighed heavily on his craft. On February 26, 2010, it was announced that Porcaro was suffering from amyotrophic lateral sclerosis (ALS), best known as Lou Gehrig’s Disease. In September 2012, it was reported in Classic Rock magazine that his condition was worsening, but was still in good spirits. At this time, he was confined to a wheelchair. Legendary session bassist Nathan East would replace him in the band and accompany the group on most of their world tours. His unfortunate passing comes at a very important time in the career of Toto as they prepare for the arrival of the highly-anticipated forthcoming album Toto XIV. The disc finds the group reuniting with bassist David Hungate and session background vocalist Michael McDonald. Their first album in ten years drops on March 24.